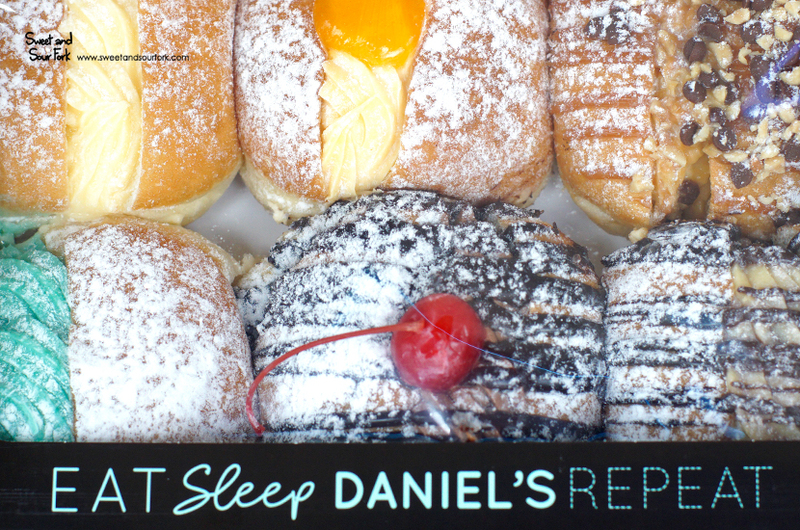 I’ve never been a big fan of donuts (though I do like them – I’m not crazy), but the hype around Daniel’s Donuts has been so big over the last year that I had to go and check it out. Everyone from mum’s co-workers to Chris’ co-workers has been banging on about how they’re the best donuts they’ve ever had, and combined with the fact that my sister was dying to visit, and that it’s actually near-ish to home, prompted a drive down to Springvale one afternoon while I was in Melbourne. 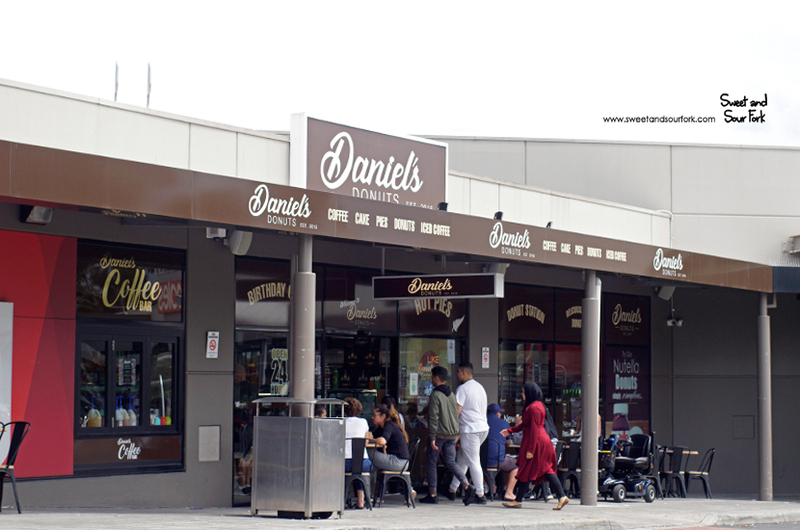 I knew beforehand that Daniel’s was a 24/7 jam, but the image I had of it in my mind didn’t quite line up with reality. Instead of a stand-alone store in a relatively empty lot (sort of like a late-night kebab truck), it was actually one of many stores in a shopping complex, indistinguishable from your run-of-the-mill cafe unless you know what you’re looking for. Step inside however, and it’s a completely different story altogether. 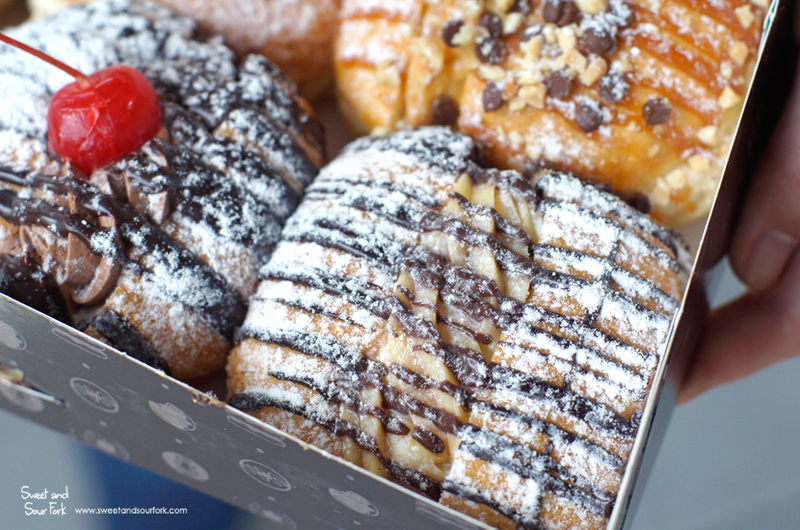 I’ve never seen that many donuts in one place, plump and dusted with powdered sugar, all lined up in the cabinets ready to be devoured. There were at least 20 flavours on offer, even with several options being sold out. There was also a dedicated vegan donut section, and some savoury pies and pastries which were a little neglected. The donuts themselves are a reasonable $3 each, but with so many choices, the box of 6 for $15 seemed like a no-brainer. It took a very long time, and several consultations with the friendly and patient staff, before we finally settled on this half dozen. 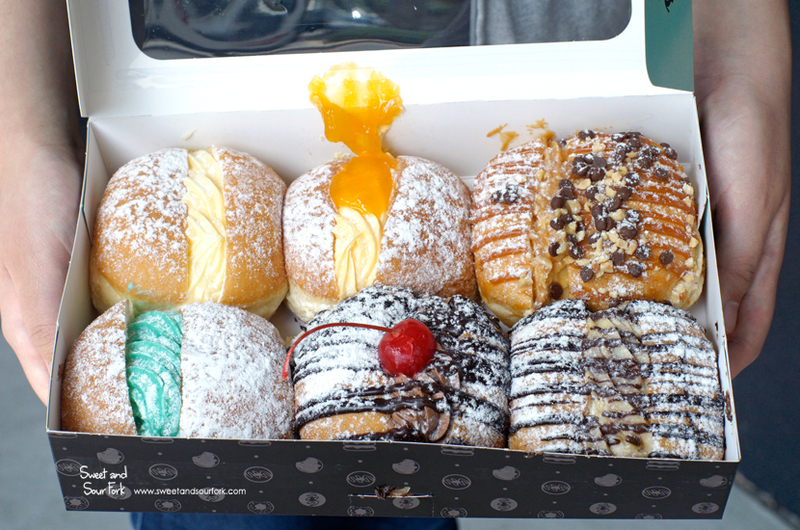 Despite how many crazy flavours there are out there, I can never go past a well-made Custard Donut. It’s such a classic, and it’s done just right here. The dough is light and fluffy, with a hint of crunch still left in the golden exterior. The custard is thick, cool, and fragrant with real vanilla bean. It’s such a simple combination, but it’s neither too sweet nor too cloying, and just begs you to down another couple after you finish your first. Even though Black Forest is my favourite cake, the Black Forest Donut was actually somewhat underwhelming. Although it had the same great donut that was filled with an airy, slightly boozy chocolate mousse, there just wasn’t enough cherry in it (read: no more than the one on top) to really make it a Black Forest donut, rather than just plain chocolate. The Mango Cheesecake Donut came at the recommendation of one of the staff as a seasonal favourite, and it definitely was a great rendition of a summer dessert. The cream in the centre was full of tropical flavours reminiscent of ripe, juicy mangos, and the dollop of jam on top gave the flavours an extra burst of fruitiness. 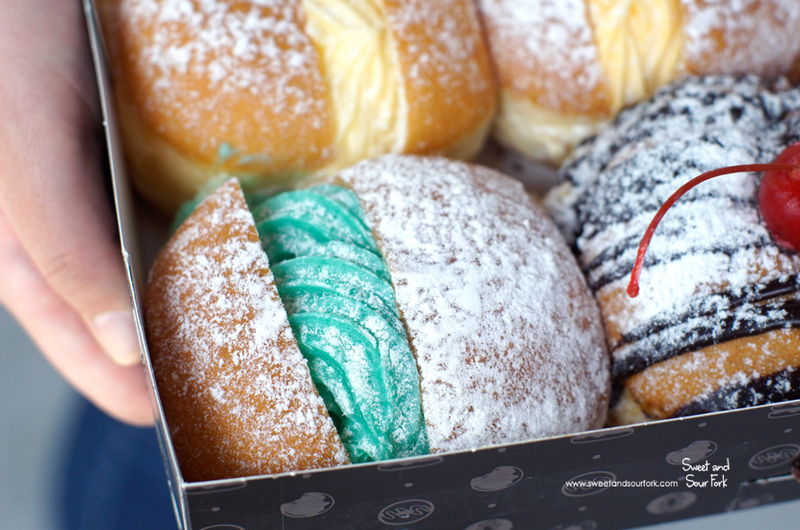 Finally, the Blue Heaven Donut, which was purchased at my sister’s behest, because according to her, you have to try everything at least once. This is like the custard donut, except instead of vanilla, it tasted like blue. You know what I mean – that terrible, wonderful artificial blue that dyes your tongue a horrifically unnatural shade that just won’t fade. First off, I tried the Chocolate Banana Donut. The custard in this one tasted pretty normal at first, but after a few seconds, I picked up on its moreishly delicious banana flavour that taps right in to that lolly banana nostalgia. This was definitely my favourite! When I moved onto the Snickers Donut, I was really expecting it to taste more like an actual Snickers bar. Truth be told, with their delicious custard overpowering so much of the donut, the only other thing I could taste was a light hint of caramel! However, when the custard alone tastes this good, it’s difficult to really complain about that. 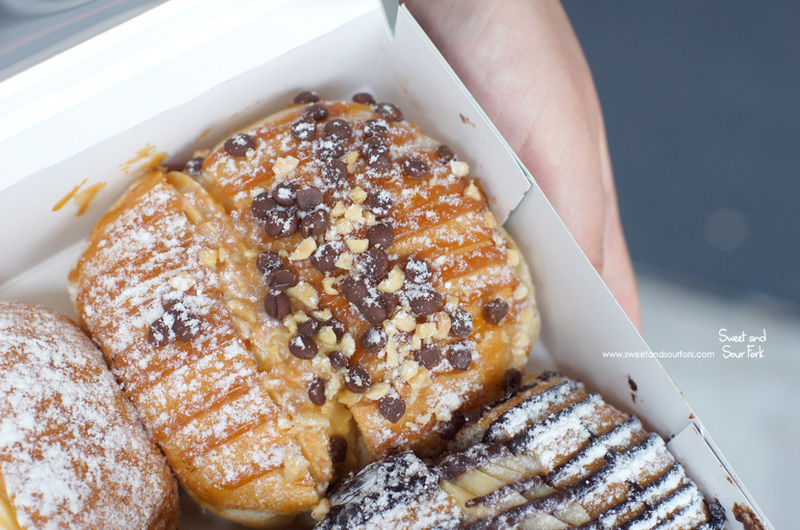 At the very least, the chocolate chips added a welcome textural contrast alongside the soft donut. It may not have tasted much like Snickers, but it was delicious all the same. So there we are – I gave Daniels donuts a crack, even though donuts don’t make me foam at the mouth like they do other people. Although I’m still yet to be converted to the donut-loving bandwagon, I will concede that I don’t remember ever having better filled donuts. The custard was an especial favourite, but given the consistent quality across all the donuts we tried, I’d wager pretty much any flavour would be a safe bet. And not that I ever see myself doing this but, it is a pretty intoxicating feeling knowing that I can get fresh donuts in the middle of the night, should the urge ever strike. Rating: 13/20 – custard me.